The mission of Russell Christian Academy is to partner in equipping students to embrace Biblical truth, achieve their God-given potential, and engage the culture for the cause of Christ. What is a Christian school? A Christian school should be much more than a safe alternative to public school with a required Bible class and once-a-week chapel services. Although possessing these characteristics, Russell Christian Academy exists for a much higher purpose. Our school teaches absolute truth from a Biblical worldview across multiple curricular disciplines. We hold Christ as preeminent in the educational process as we partner with parents in training cultural warriors, ready to engage the arena of ideas for the cause of Christ! A school of almost four-hundred students, Russell Christian Academy believes parents are Biblically responsible for the education of their children and therefore are vital to the educational process. Parents desiring an intentional, deliberate philosophy of education which centers around a child's development of a Biblical worldview should consider Russell Christian Academy. 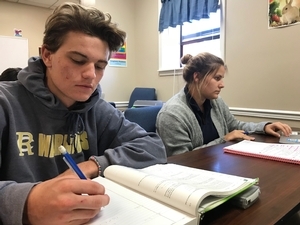 As the largest Christian school in an over 80-mile radius, Russell Christian Academy provides a well-rounded, college-prep education from a Biblical worldview. We desire for every student to achieve their God-given potential and honor God with their talents and abilities both inside and outside of the classroom. Thursday 10:00am there will be a school wide Easter Chapel Service held in the Worship Center. Parents are welcome to attend. Students will dismiss on Thursday April 18th at 12:00, no Afterschool provided. School is CLOSED on Friday April 19th and Monday April 22nd in Observance of the Easter Holiday.